When Tori Downing takes possession of the abandoned Hamilton estate on the longest peninsula on Lake Jefferson, Arkansas, she avoids revealing her connection to the ill-fated Hamilton family. Is the glowing image that shimmers in the second floor window of Victoria House the ghost of Victoria Hamilton? Can Tori handle moving into a house with paranormal activity…again? Until she leaves her career at the Arkansas State Crime Lab behind, she never even considers moving to Lake Jefferson, but the fallout from scandal gives Tori a very good reason to escape to Hill County and refurbish and restore the old family mansion. She settles into her new life…until the old accusations from her past start resurfacing. Drawn together to solve the murder of Jared Crenshaw, Tori and Lt. Grayson of the Hill County Sheriff’s Department dive into a tangled web of jealousy, deceit, and revenge as they attempt to solve both crimes, Jared’s death and the mysterious death years ago of Victoria Hamilton. Grayson’s past keeps interfering with his present, causing turmoil in both his professional life and his personal life. Can their love survive revealing the truth—from both the past and present—surrounding the tragedies at Victoria House? I read the first book in the Haunted Hearts series, Laurel Heights, a while back. This book, while entertaining, seems to merely fill in bits and pieces of what happened in Laurel Heights from the standpoint of other characters. The plot overall was good, but I felt as if all the mentions of Laurel Heights were tedious as I had already read them. When confronted with Victoria House’s own peculiar problems, I was enraptured. There were so many twists and turns that I truly wasn’t sure who the bad guy was until near the end, and even then, the “why” was always a bit out of reach, never to be found. A good and quick read, but would have been nicer if it hadn’t been so entwined with a previously read book. Where the road to happily ever after takes a suspenseful detour. Want to know a little bit more about Denise? She’s a Southern girl who has lived in Louisiana all her life, and yes, she has a drawl. She has a wonderful husband and two incredible children, who not only endure her writing moods but also encourage her to indulge her writing passion. 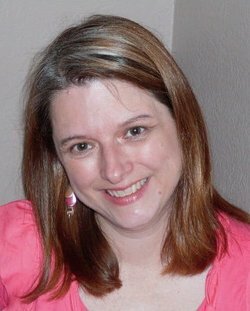 Besides writing romantic suspense, she enjoys traveling, reading, and scrapbooking. Accounting is a skill she has learned to earn a little money to support her writing habit. She wrote her first story when she was a teen, seventeen handwritten pages on school-ruled paper and an obvious rip-off of the last romance novel she had read. She’s been writing off and on ever since, and with more than a few full-length manuscripts already completed, she has no desire to slow down. Learn more about Moncrief and her books by visiting her Amazon page.